Last year, I featured a few of my memorable souvenirs (Thai Beer Can Tuk-Tuk and Tibetan Prayer Wheel) from a trip around the world. They were a lot of fun to share, so I'm bringing the idea back as a series every other Saturday. If you have a unique souvenir or story to share, please read our submission guidelines. I tend to be cautious when buying souvenirs, especially in countries known for haggling. I'm always concerned about getting ripped off, or getting poor quality knock-offs of the real thing. 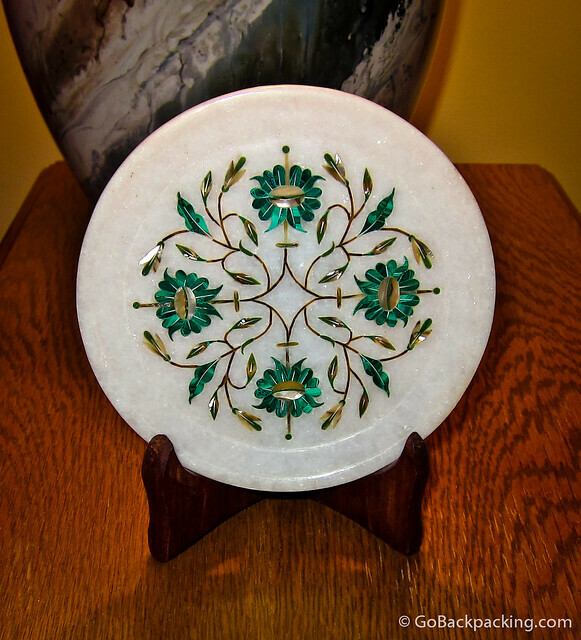 The most popular souvenir from Agra, India, home to the Taj Mahal, is marble with inlay designs similar to what you'll find on the Taj Mahal itself. The objects come in all shapes and sizes, from little boxes and plates to end tables, and pieces of furniture. 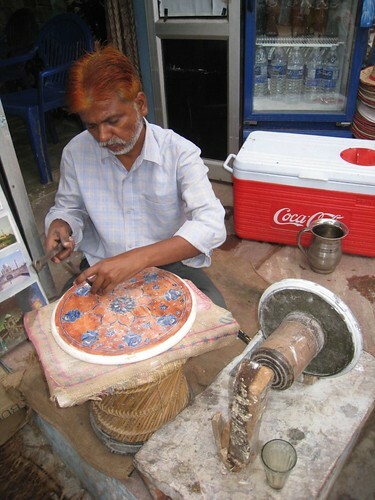 If you visit the Taj Mahal, chances are you'll end up in at least one marble shop, if not several. Tuk-tuk drivers love to take tourists to them as they get kickbacks in the form of money or gasoline. The key to avoiding fake marble is opacity. Real Agra marble is opaque, and will not let light through. The legitimate marble shops will be happy to demonstrate their quality goods by turning the shop lights off and holding a lamp or flashlight up against their products. I bought a little plate, and a small box, trying to keep the size and weight of my souvenirs to a minimum, however the much larger objects available, such as end tables, were often reasonably priced, and the shops could arrange for international shipping at the time of sale. If I recall correctly, a marble end table with a beautiful design on top might cost around $200. Of course this is a lot of money in India, but for Americans and Europeans, in retrospect, it's a steal. 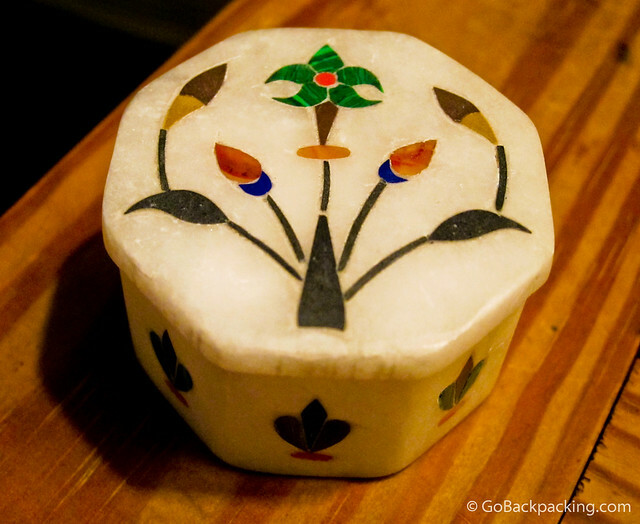 There is the added shipping cost to consider, but overall, buying a larger marble souvenir from Agra is one of the few shopping regrets I had upon arriving home from my trip.